Last week, I came home to this sight. That is my (amazing) walk-in closet. And that is a hanging rack pulled out of the wall, with all the boxes that were atop the rack scattered all over the floor. I was pretty surprised that this particular rack fell, as it’s rarely used and hadn’t been touched in at least a week. But when it’s your time, it’s your time. One of the features I fell in love with when I bought this house was the closet. Seriously, people have bedrooms smaller than this room. But the closet wasn’t well laid out. 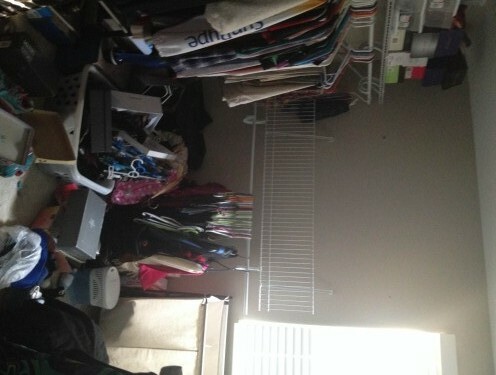 The racks were simply pieces purchased at Home Depot and attached to the walls. They weren’t the best use of the space for sure. But they worked. 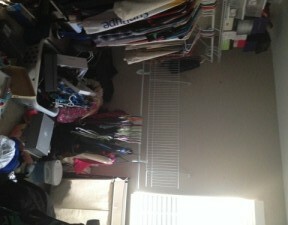 I have known for quite some time that I wanted to have the closet reworked. And as much as I like to save money, DIY wasn’t going to cut it. I know my limitations. So I have been looking at different closet companies, seeing what kinds of sales they offer, checking out features at shops like The Container Store, and reading review after review. Still, it was mostly just window shopping. I didn’t think this was something I would be doing for quite some time. And then I came home to the above. Sure, I could have just replaced that particular rack. I’ve done it before with a rack on the opposite wall. But I decided it was a sign. I still had some money put aside from Christmas and my birthday that I was saving to spend on something for my house. Obviously, the house wanted me to spend the money on the closet. So I called my preferred company. This was the one with the best reviews and the best warranty. Conveniently, their current promo was one of the best I had seen as well. So I had my fingers crossed that they could come in under the budget I had set in my mind. One thing that I LOVED about the designer who came was that I never once felt pressured to upgrade. She asked me if I wanted a particular feature on my closet and I didn’t really have an answer. She said “Well, most people with carpeted closets like yours don’t add it. And it’s cheaper if you don’t.” Sweet. The one thing I hate about having sales people come to the house is the insane pressure to buy. When the final design was done and the numbers were in, I was delighted. It was well under what I had anticipated paying (though I didn’t tell her that). They could get it all done within a month or less. And given that I had researched the company, talked to former customers, and really looked into their policies, I felt comfortable signing right away. Sure, normally I would recommend getting multiple estimates, but when the end product is different, it’s not just about the money. So now I have to clear out my closet, tear out the remaining racks, spackle and paint, and then wait for the installers. I’m pretty excited. I guess this is what being a grown-up is all about.